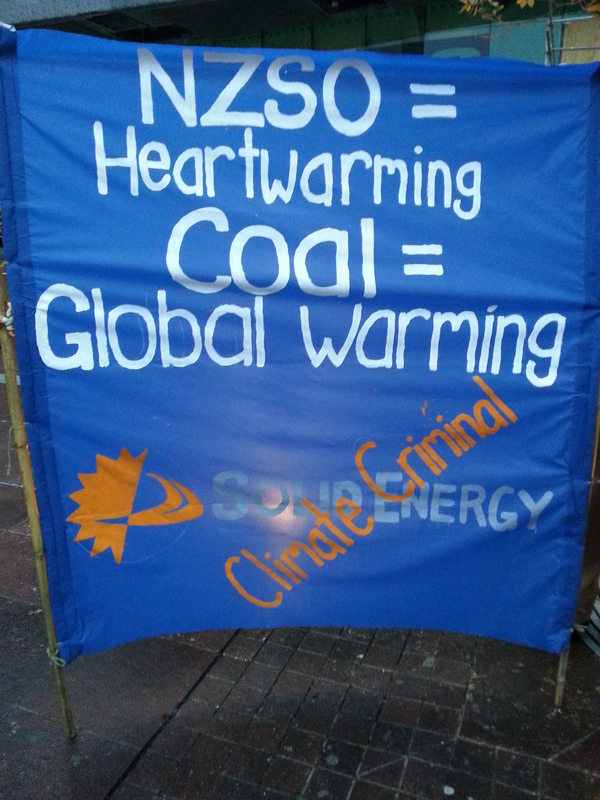 Tonight, Auckland Coal Action (ACA) will again picket a Solid Energy sponsored NZSO concert at Auckland Town Hall in protest against the national coal miner. “Coal is the dirtiest fossil fuel and leading scientists agree that it must stay in the ground if we want to avoid leaving our children and grandchildren with climate chaos.” He commented further. “Just like all those dirty tobacco companies, Solid Energy is promoting itself as one of the ‘good guys’ through association with our wonderful national orchestra. That’s not OK. They’re not the ‘good guys’.” Mr Dunlop added. “The NZSO has been compelled to accept dirty sponsorship because of a lack of state funding. We support full state funding for the NZSO and are happy to pay the taxes to support this.” He said. Auckland Coal Action is an independent community group committed to the ambitious goal of saving future generations from the chaos of runaway climate change. Auckland Coal Action has sent an open letter to the NZ Symphony Orchestra, opposing sponsorship of the orchestra by state coal miner, Solid Energy. The letter says, “We love the NZSO, but coal is dirtying your good name” and suggests that accepting sponsorship from a coal mining company is akin to accepting it from a tobacco company. (Tobacco sponsorship was banned by the Government in 1985 due to the harm it caused the community). “We no longer accept tobacco sponsorship of cultural and sporting events, so why should we accept sponsorship from coal companies such as Solid Energy?” says ACA spokesman, Tony Dunlop. Auckland Coal Action will protest outside the NZSO’s concert at the Town Hall on Friday evening, and hand out leaflets to concert-goers as they enter the Town Hall. “We support the orchestra, but not its sponsor – so this protest will be a friendly one. We’ve outlined our position in the open letter to the New Zealand Symphony Orchestra, “says Mr Dunlop. In the open letter, ACA says action on climate change is more urgent than ever with huge quantities of coal left, that if burned could raise the temperature of the earth by as much as 15 degrees. “To save the planet from runaway climate change, leading scientists advise that we must phase out coal to zero by 2030,” says Mr Dunlop for Auckland Coal Action. Solid Energy uses arts sponsorship to try and create a good public image, although its’ business is based on extracting coal – the dirtiest of the fossil fuels, and the biggest contributor to climate change. The company’s recent actions in slashing its workforce show they have as little regard for their workers as they do for the climate. When the harm caused by the sponsor – to the climate, local environment and its own workers outweighs any benefits by such a large margin – then it’s time to act, he says. We want to alert the government to our dissatisfaction that such an important institution as the NZSO has been reduced to accepting sponsorship from a coal mining company, due to a lack of state support. Auckland Coal Action recognises that coal is the most damaging of fossil fuels and that its on-going use is causing catastrophic climate change. We aim to achieve a coal-free Aotearoa before 2030, initially by opposing the expansion of coal mining. We do this work to play our part in sustaining a livable climate for us, our children and grandchildren, and those that follow them.